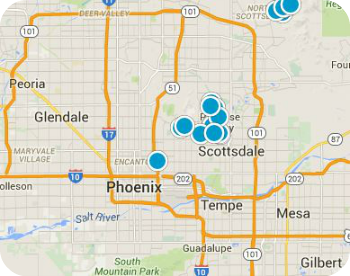 Want to live in one of the hottest neighborhoods in the Metro Phoenix area? 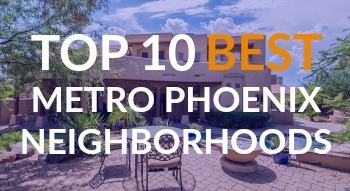 Check out the Phoenix New Times tally of the 10 Best Metro Phoenix Neighborhoods below along with ALL available listings in these terrific communities. FQ Story - One of Phoenix's oldest neighborhoods, FQ Story features a delightful blend of some of the nation's earliest and most popular architectural styles as well as a location that's convenient location to, well, just about everything. FQ Story homes for sale start at $249,000. Willo - Cozy historic cottages and access to everything that matters in Metro Phoenix (downtown, the airport and freeways) make it no surprise that The Willo Historic District is a staple on the list of best neighborhoods in downtown Phoenix. Willo homes for sale start around $325,000. Medlock Place - Lush landscaping and quintessential southwestern architecture give this Phoenix neighborhood a sense of rural living smack in the middle of the city. Medlock Place homes for sale start in the low $300,000s. Woodlea Melrose - There's a lot to love about this quaint Phoenix neighborhood: from its wide, tree-lined streets and family-friendly sidewalks, to its charming homes built in the 1930s and '40s, to nearby shopping and dining in the Melrose District. Woodlea Melrose homes for sale can be found starting around $225,000. Windsor Square - If neighborhood walkability is your thing, Windsor Square might be just your place. Spacious homes set along wide streets are within walking distance of upscale shopping and dining. Windsor Square homes for sale start at $475,000. Agritopia | Gilbert AZ - Agritopia is a masterfully planned master-planned community built in the early 2000s with some unique features including a farm and community garden. Schools, restaurants and services are also on site. Agritopia homes for sale start around $260,000. Coronado - Eclectic architecture, friendly neighbors and nearby hotspots make Coronado appealing to young professionals, families and anyone else who appreciates being in the center of it all. Coronado homes for sale start around $180,000. Maple-Ash | Tempe AZ - Located within walking distance of the Arizona State University campus, Maple- Ash is known for its cool college vibe, trendy restaurants and bars and a flock of wandering peacocks. Maple-Ash homes for sale can be found starting at $215,000. Marlen Grove - An enclave of Mid-Century modern homes make Marlen Grove a popular and oh-so-trendy pick among Phoenix neighborhoods. Marlen Grove homes for sale start in the high $300,000s. Encanto-Palmcroft - Pre-World War II homes set on large lots give Encanto-Palmer a dramatic, movie set feel. Encanto-Palmcroft homes for sale start around $475,000.